This is the first evidence of inter-continental trans-oceanic return migration of Great White Sharks (Carcharodon carcharias) and the implications of this discovery were extremely important for conservation efforts to help list this species on the CITES Appendix II in October 2004. 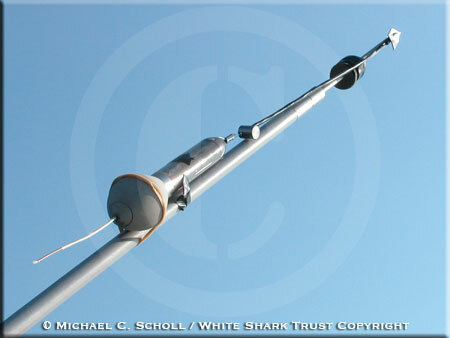 The Wildlife Conservation Society in association with Marine and Coastal Management, the White Shark Trust, the Universities of Cape Town and Pretoria and the South African Museum tagged white sharks off the Western Cape (South Africa) between June 2002 and November 2003 with 25 pop-up archival satellite transmitting (“PAT”) tags, 7 near-real-time satellite (“satellite”) tags and 25 acoustic tags to study their spatial-dynamics. Using high-resolution photographic fingerprinting techniques the White Shark Trust also recorded the daily presence/absence of individual White Sharks off Gansbaai (34°39’S 019°24’E; Western Cape) since October 1997. 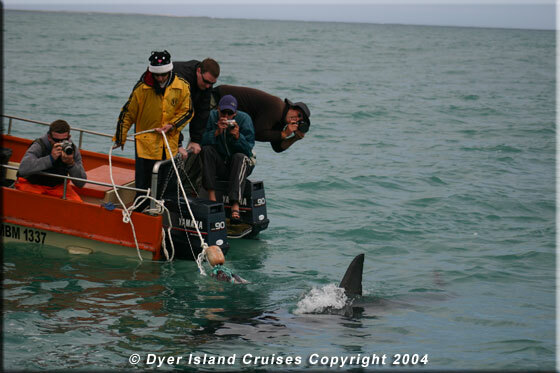 On the 7th of November 2003, a circa 380 cm (about 12.5 feet) total length female Great White Shark was tagged with a PAT (Pop-up Archival Transmitting) satellite tag in an area known as Haibaai near Dyer Island, Gansbaai, Western Cape, South Africa. On the 28th of February 2004, the PAT tag released itself from the Shark at the pre-programmed date. The pop-up location indicated that this Shark travelled in 99 days to a location 2 km from shore and 37 km south of the Exmouth Gulf in Western Australia (22°01’05”S 113°53’13”E) about 11'000 kms from her tagging site. Moreover, this Shark is well known to the White Shark Trust photographic identification database as she has been visiting Dyer Island since 1999 when she was first recorded. 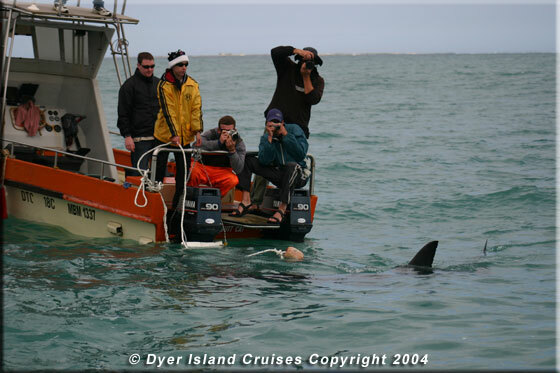 On the 20th of August 2004, Michael Scholl was conducting his ongoing fieldwork around Dyer Island when he spotted the very distinctive dorsal fin of this same Shark. The White Shark Trust identification reference number for this Shark is WST/1308. The Wildlife Conservation Society reference number for the tag is WCS/P12. But in honour of Nicole Kidman, famous Australian actress and known for her love for Sharks, we decided to call her 'Nicole'. We will refer to this Shark as Nicole or 1308/P12 in this article. The present web page discusses these results in depth and presents some additionnal information and photographs that could not be included in the published article. Sections of the following text form part of the original published article. Contact us for a PDF version of the original article published in Science or read it online. 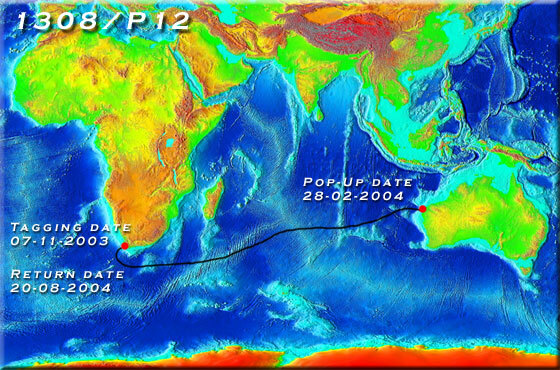 Figure 1 shows the approximated path followed by Nicole from the tagging site in Holbaai on the 7th of November 2003 to the PAT pop-up site just off the west coast of Australia on the 28th of February 2004. This path is the result of complicated calculations from the geolocation data collected by the PAT tag during the 99 days. Unlike a SPOT (Smart Position Only Tag) satellite tag which needs to break the water surface to emit a signal that can be picked up by the ARGOS satellite system to get a location, a PAT tag is an inactive satellite tags until the pop-up date at which time the tag detaches itself from the Shark and floats to the surface and only then starts transmitting. During the attachment period, the PAT tag will record three parameters: swimming depth, ambiant water temperature and light intensity. All the depth and temperature information is summarised for each day and stored in the internal memory (hence the archival name). From the light sensor, the tag estimates sunrise and sunset times for every day and these are also stored in the internal memory. Figure 1a: Return intercontinental transoceanic migration of Shark 1308/P12 between Dyer Island (Gansbaai, Western Cape, South Africa) and the northwestern coast of Australia plotted on a topographic map. Black line is an estimated path followed by the Shark from South Africa to Australia from analysing the geolocation data recorded by the PAT tag. Figure 1b: Transoceanic migration of a white shark from South Africa to northwestern Australia and possible first leg of a second transoceanic-migrating shark. Geolocation-estimated positions of shark 1308/P12 (black dots) based on light-intensity records and possible path during this migration (solid line). The start of another possible migration to Australia is shown by the auto-release location of the PAT tag from shark P3 (blue line and square). Tagging and popup dates are: 1308/P12: 07/Nov/2003 and 28/Feb/2004; and P3: 14/Apr/2003 and 25/Dec/2003. Sea Surface Temperature (SST) is an average composite of daily 4-km resolution MODIS data for 23/Nov/03-28/Feb/04. Southwest Indian Ridge shown as white depth contours (100-2,000 m). Scale bar represents 6,000 km. Figure 1c: Transoceanic migration of a white shark from South Africa to northwestern Australia. Differential time-at-depth patterns during the coastal (left) and oceanic (right) legs of Shark 1308/P12 showing strong preference for the first 0.5 m of depth, then for depths of 500-750 m during oceanic travel. Minimum (black line and squares) and maximum (bright blue line) depths and minimum temperature (orange dots) visited by 1308/P12 during the coastal and oceanic legs of its movement; all data in 6-hr periods; arrow marks beginning of transoceanic migration. At the pre-determined pop-up date, the tag detaches itself from the Shark and floats to the surface. This is when the PAT tag starts transmitting all the data accumulated and stored in the internal memory. The ARGOS satellite system will pick up the signal and will be able to pinpoint the location of the now drifting PAT tag. Hence, with PAT tags, we only have two very precise GPS (Global Positioning System) locations for the Shark: the tagging site (from the boat GPS) and the pop-up location. So how did we plot the path shown in figure 1? From the estimated sunrise and sunset times calculated and recorded by the tag... These times can be compared to the internal clock which is synchronysed to the tagging site for example. As the Shark is moving east or west (longitude), sunrise and sunset times will vary and an estimated location can be calculated. The location is not precise and only long range movements can be analysed with this geolocation system. This geolocation can further become more precise when integrating the water temperature and maximum depth (the Shark is likely sometimes to go to the sea floor if diving) data into a global GIS system. But the resulting movement plot will never be very precise, it will remain an estimated path. PAT or Pop-up Archival Tag is ready for deployment on the tagging pole. Shortly after the PAT tag pop-up date at the end of February 2004, the information collected and stored started to be transmitted back to the ARGOS headquarters and further forwarded to Dr. Ramón Bonfil at the Wildlife Conservation Society (WCS) headquarters in New York. Dr. Ramón Bonfil is the project leader of the South African satellite tagging project in collaboration with Marine and Coastal Management (DEAT-MCM). The White Shark Trust, the University of Cape Town, the South African Museum and the University of Pretoria are also part of this collaborative effort to better understand the movement patterns of White Sharks using satellite tracking technology. The news of this extraordinary voyage from South Africa to Australia were extremely exciting, but had to be kept quite at the time due to publishing constraints. Dr. Ramón Bonfil of the Wildlife Conservation Society holding a PAT tag on the tagging pole ready for deployment. This shark’s circa 10,800 kilometer course entailed an anticlockwise semi-circle 500+ kms south of Cape Agulhas (the Southernmost point of the African continent), followed by an extraordinarily direct eastward path towards NW Australia, indicating that white sharks do not need oceanic islands as gateways for transoceanic migration as previously hypothesised. Nicole travelled at a minimum speed of 4.7 km/h during this journey, the fastest sustained long-distance speed recorded among shark species and comparable to that of some of the fastest swimming tunas. 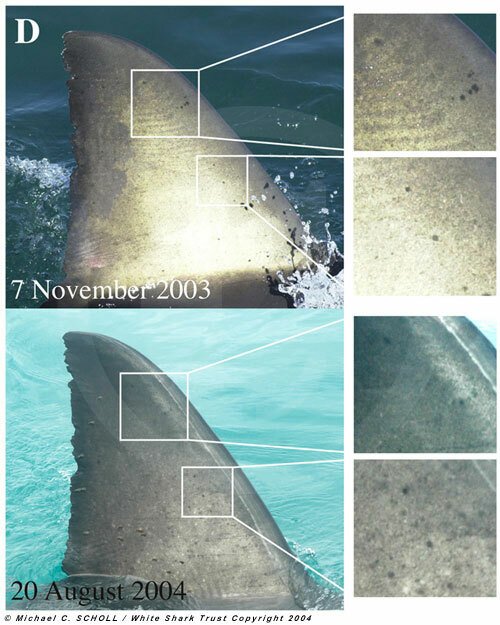 Photographic fingerprinting allowed identification of this shark back at its original tagging site off Gansbaai on 20 August 2004 (see below and figure 3). This migration circuit is remarkable not only because it starts and ends in the exact same location but also because it is the fastest known transoceanic circuit-migration among marine fauna, taking just under nine months to complete a circa 20,000 km trip. Figure 1a and 1b illustrate the hypothetical plot (solid black line) of the migration route followed by Shark 1308/P12 over a topographic (depth) map and SST (Sea Surface Temperature) map respectively, from South Africa to Australia. Geolocation positions (black dots) obtained from the PAT tag's light sensor are indicated in Figure 1b from which the estimated plot (solid line) was calculated. 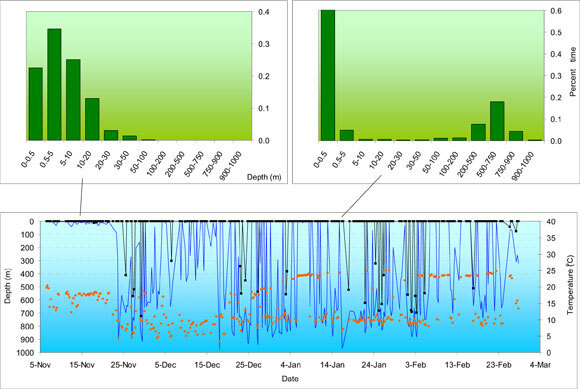 We analyzed the satellite-transmitted summary data to reveal the diving pattern of this shark and discovered that daily, during the onward journey from South Africa to Australia, the Shark took frequent deep-dives, reaching record maximum depths (980 m) and ambient temperatures (3.4°C), and spent 18% of the time at depths of 500-750 m (Figure 1c). Surprisingly, it spent significantly more time just below the surface (top 0.5 m) while in oceanic waters (61%) than when it was in coastal waters (23%), swimming most of the time (66%) above 5 m during this trip. This preference for just-below-surface-swimming during oceanic travel constitutes a previously-unknown behavioural pattern for white sharks and suggests that similar to other vertebrates, it may have used visual stimuli, perhaps in the form of celestial cues, as an important navigational mechanism in addition to, or instead of following gradients in earth’s magnetic field as commonly accepted for sharks. 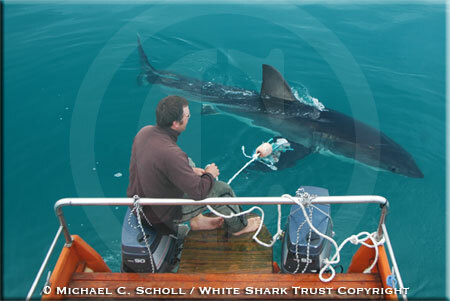 Michael Scholl and Shark 1308/P12 on Lamnidae, the White Shark Trust research boat, on the 21st of August 2004. 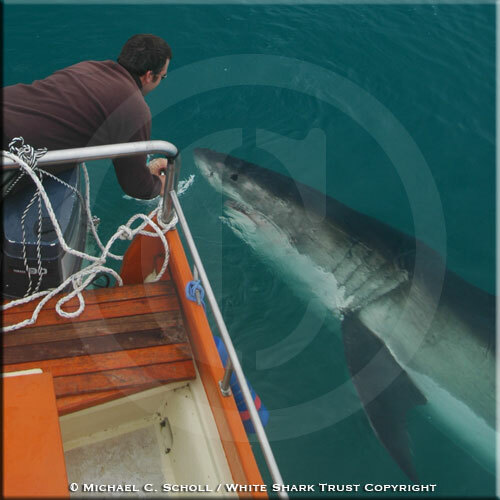 Michael Scholl of the White Shark Trust started looking at the photographic identification database which he has been building since 1997. 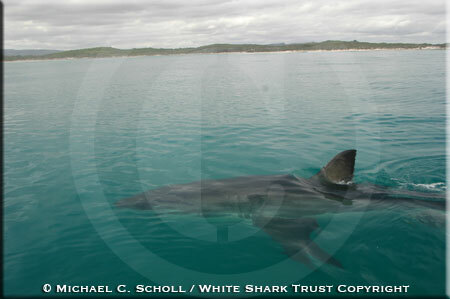 Shark 1308/P12 is a well known Shark to Michael Scholl's fieldwork and database. She was recorded for the first time on the 19th of September 1999, five years prior to the present news. This Shark has been sighted 38 times over the past six years (1999 - 2004). 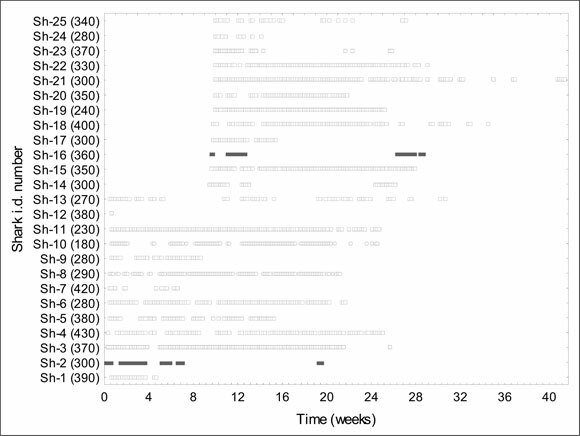 Figure 2 shows the periods when Shark 1308/P12 was observed in the Dyer Island area. The numbers indicate the number of days this Shark was observed each month. 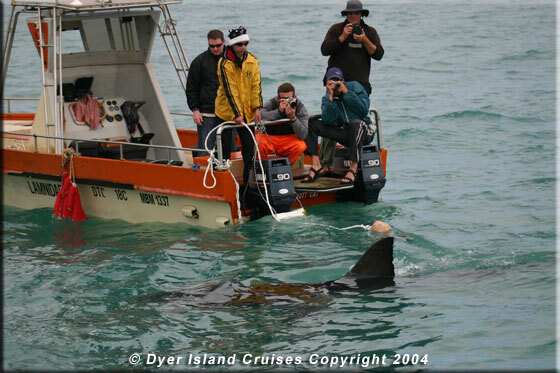 Figure 2: Presence period of White Shark 1308 / P12 at Dyer Island from the photographic identification database from 01 January 1999 through 31 December 2004. Numbers indicate the number of days this Shark was observed for each month. Remembering also that a 380 cm TL (total length) female White Shark is still immature as far as we know... Why would a Shark undertake this yearly migration? The White Shark Trust field research team (from left to right: Callum Call, Holly Frank, Andy Brandy Casagrande, James van den Broek are field research assistants of the White Shark Trust, and Michael Scholl in the back on the riht) with Shark 1308/P12 swimming past Lamnidae. Photograph taken by Dyer Island Cruises, the local boat based Whale Watching company. 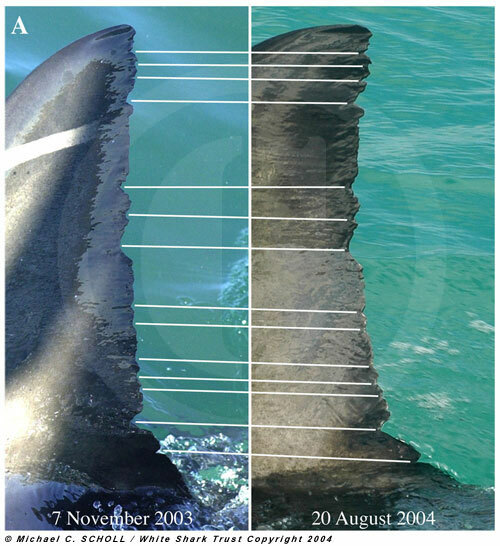 Figure 3 illustrates the photographic identification methodology designed and developped for White Sharks by Michael Scholl, and demonstrates that the Shark tagged with PAT tag P12 on the 7th of November 2003 is indeed the same Shark photographed on the 20th of August 2004 after her return trip to Australia. 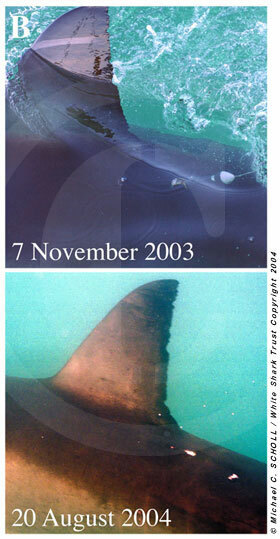 Figure 3 compares one identification photograph taken the day of the tagging on the 7th of November 2003 to another picture taken on the first subsequent observation on the 20th of August 2004. Figure 3a compares the trailing edge of the first dorsal fin. 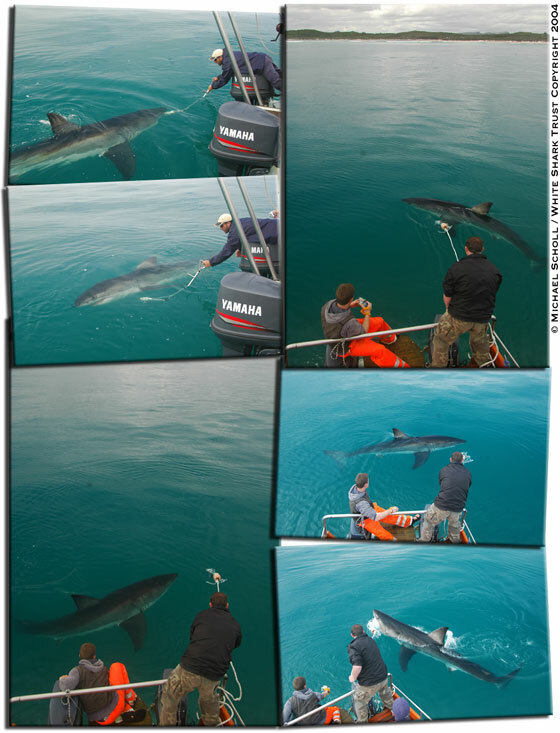 The white lines link corresponding notches between the two identification photographs, clearly demonstrating that the two images are from the same Shark. Figure 3b shows the left side of the Shark's body behind the dorsal fin where PAT tag P12 was inserted on the 7th of November 2003. On the bottom picture, the tag is absent as it had popped-up (28 February 2004) nearly six months prior to the second picture being taken (20 August 2004). Nevertheless, three apparent white scars are still clearly visible: tag insertion point, scratch scar from the overgrown tag lead and from the buldging tag flotation. Figure 3c and 3d further illustrate the positive identification of this Shark between 07/11/2003 and 20/08/2004 by comparing small pigmentation features present on respectively the left and the right side of the first dorsal fin. 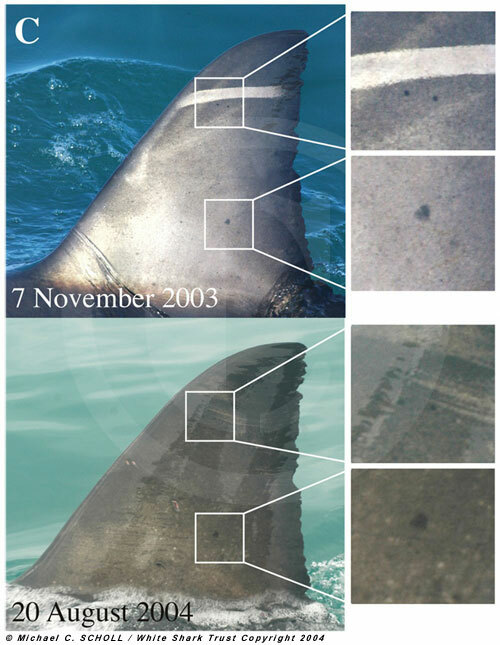 Figure 3d: Photographic fingerprints of Shark 1308/P12 at tagging (07 November 2003) and upon return to tagging location in Gansbaai (20 August 2004) after its transoceanic migration to Western Australia: Right side of first dorsal fin with magnified details (left inserts) showing unique black pigmentation pattern aiding fingerprinting. 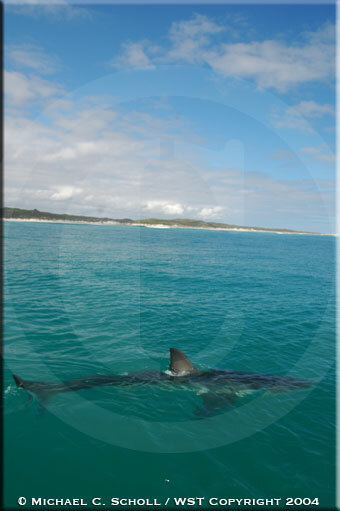 Logged photographic data show shark 1308/P12 was a seasonal visitor (June-December) to the Gansbaai area (Figure 2), having been recorded 28 times during 1999-2004, suggesting that it is a South African shark and that the transoceanic circuit-migration could be an annual natal-homing event. A second PAT-tagged shark (unsexed, ca. 200-230 cm TL; number P3) travelled to an offshore location 242 km SE of Port Elizabeth where its tag detached on 26/Dec/2003, in what appeared to be the start of a migration towards Australia (Figure 1b). The transoceanic circuit-migration of Nicole is of key importance: it is the first direct evidence of connectivity between widely-separated white shark abundance centres, critical for our understanding of white shark population structure and for conservation and management. 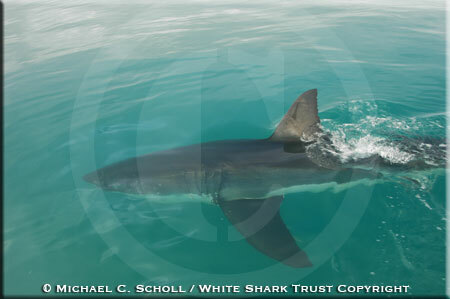 Our results also confirm philopatry in White Sharks. In addition, the size of Shark 1308/P12 suggests it could reach sexual maturity soon and we speculate that it could eventually mate off Australia. In this event, the likely return of this shark to give birth off South Africa would provide further support to general reproductive behaviour theories of marine fauna and signal the need for protection of pregnant females facilitating a crucial genetic link between distant subpopulations. On a smaller scale, white sharks frequently perform long-distance coastal circuitmigrations (>2,000 km) from well-known abundance sites in the Western Cape, first northeastwards using well-defined underwater corridors along the continental shelf and sometimes very close to shore, to waters off KwaZulu-Natal and beyond, then returning to Western Cape sites after periods of 4-6 months (Figure 4). Two out of six satellite-tagged sharks that were tracked for >2.5 months and one PAT-tagged shark showed long-distance coastal circuit-migrations back to their exact original tagging site. Shark S1 (a 284 cm TL female) tagged in Mossel Bay (34 deg 08 min S 22 deg 07’ min E) during May 2003 completed the first directly-observed long-distance circuit-migration for a shark or ray species, moving in 65 days to waters just northeast of Delagoa Bay (Mozambique) and outside the South African EEZ where white sharks are legally protected (Figure 4a). It returned to Mossel Bay 162 days after tagging and was photographed with the transmitter still attached to its dorsal fin. Another shark double-tagged with satellite and acoustic tags in Mossel Bay during May 2003 (number S2, a 310 cm TL female), followed a close-inshore path to the Tugela Bank where it last transmitted 46 days after tagging. This shark was recorded by our acoustic-tag bottom-monitors back at its original tagging site 123 days after tagging (Figure 4a). 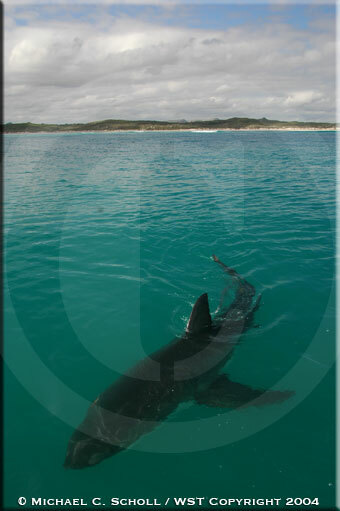 Shark P11 (a PAT-tagged 388 cm TL male) moved between Gansbaai and the Tugela Bank between 5/11/2003 and 31/01/2004 (Figure 4b), then was re-sighted, captured and fitted with a satellite tag in Gansbaai on 26/05/2004. 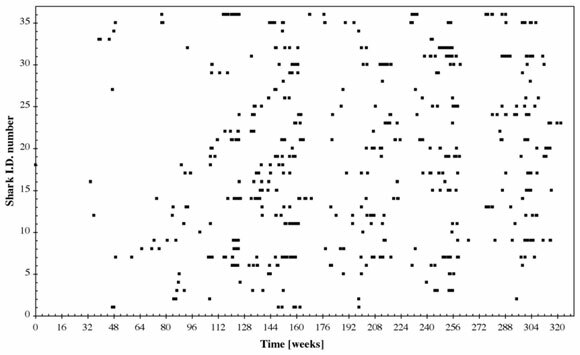 Individual white sharks commonly disappear from Mossel Bay and Gansbaai but eventually return to these preferred sites after several months of absence (Figure 5), further suggesting that these long-distance circuit-migrations are common. Figure 4a: North-eastward long-distance circuit-migrations of South African sharks. Tracks of two satellite-tagged sharks showing long-distance circuit-migrations and crossing to Mozambique; shark S1 left Mossel Bay after tagging (24/May/2004), moved rapidly to Bird Island residing within a limited area (385 km2) for 27 days, continued northeast along the shelf-edge then in deep water beyond the Agulhas Current, reaching Mozambique 65 days after tagging. Transmissions ceased after 11 days in Mozambique to resume at Bird Island 62 days later; shark S1 returned to its original tagging location on 2/Nov/2003. Shark S2 tagged on 31/May/03 with satellite and acoustic tags, travelled steadily along the coast to the Tugela Bank in 37 days where it ceased transmitting 9 days later, and was recorded by bottom-receivers back in Mossel Bay on 1/Oct/04. Red star is tagging location; dashed line is movement between long periods without transmissions. 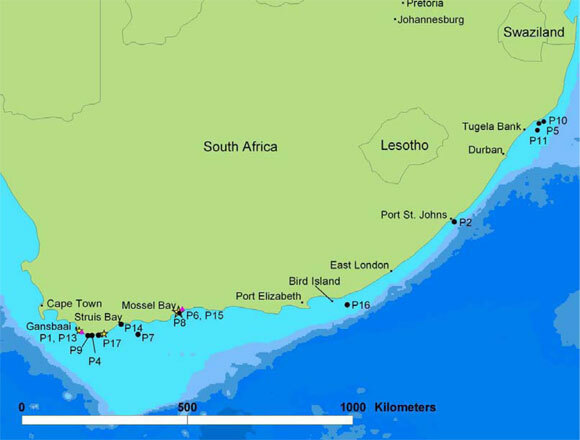 Figure 4b: North-eastward long-distance circuit-migrations of South African sharks. Movements of 15 PAT-tagged sharks that travelled to shelf waters; yellow stars show tagging sites, black circles pop-up locations, pink triangles represent two tags popping-up in the same location. Four additional PAT-tagged sharks (numbers P2, P5, P10, P16) travelled to points close inshore scattered along the Eastern Cape and KwaZulu-Natal. 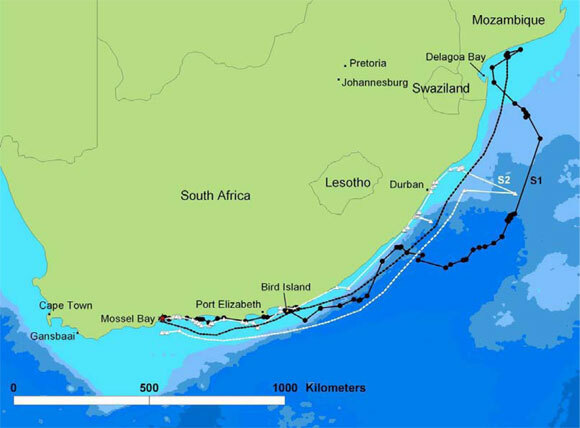 Their movements and those of sharks S1, S2 and P11 indicate that white sharks might be using the most-parsimonious route along the continental shelf and close inshore (avoiding the strong south-bound Agulhas Current) when travelling towards the Tugela Bank or further north (Figure 4b). The relative large number of white sharks moving to the rich environment of the Tugela Bank which hosts important fishery resources and serves as nursery ground to a number of teleosts and elasmobranchs suggests that these long-distance coastal circuit-migrations might be feeding-related events. 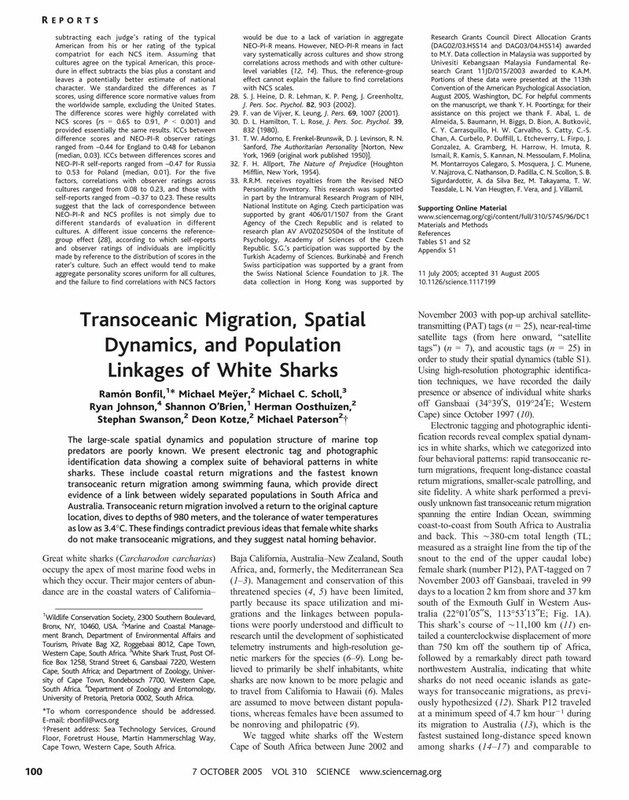 Other white-shark’s spatial-dynamics patterns include small-scale return migrations and site fidelity. Four satellite-tagged sharks showed small-scale return migrations (<1,000 km) including one shark making a short westward trip and returning to its tagging site after travelling 19 days and 970 km, and three other sharks moving alternatively for periods of 75-201 days between close-to-shore Western Cape locations < 200 km apart. Site fidelity is evidenced by the remarkable return of shark 1308/P12 to Gansbaai, as well as by shark S1 in its repeated visits to and residency in a small area east of Algoa Bay (Bird Island) and Mossel Bay (Figure 4a) and by three PAT-tagged sharks (numbers P13, P8 and P1; Figure 4b) and an additional satellite-tagged shark that remained in their tagging locations for periods of 29, 33, 75, and 32 days respectively. 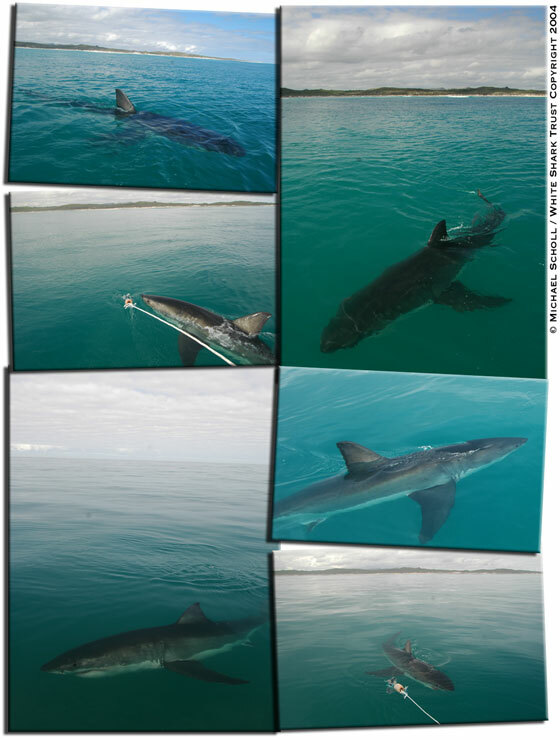 We found additional evidence for site fidelity in the extended residence of white sharks in Gansbaai (up to 68 days) and Mossel Bay (up to 211 days) and their propensity to return to these areas after considerable periods of absence (Figure 5). Figure 5a: Residence times of white sharks in two high-abundance areas in the South African coast, showing site fidelity and periods of absence followed by return. Presence-absence of 25 acoustically-tagged sharks in Mossel Bay. Maximum residence was 211 days (sh-13); maximum absence with a return was 95 days (sh-16). Numbers in brackets on the y axis are visually-estimated total lengths in cm; starting date for x axis is 1/Jun/2002; solid squares are males, empty squares females, circles unsexed sharks. Figure 5b: Residence times of white sharks in two high-abundance areas in the South African coast, showing site fidelity and periods of absence followed by return. Presence-absence of 36 sharks photographically fingerprinted off Gansbaai (Dyer Island and neighbouring areas) for which records span more than 3 years. Maximum residency (absence of less than one week not considered) was 64 days (shark number 36), maximum absence with a return was 1'381 days (shark number 33)..
Management of white sharks, and perhaps many marine top-predators, can not be effected locally, or even regionally. Our studies show that we do not clearly understand the way in which identified populations, or subpopulations, are connected. Long-distance and transoceanic migrations expose great whites to increased risk of mortality as sharks migrate out of domestically-protected waters in South Africa into neighbouring or remote countries sometimes located across entire ocean basins. An increasing global demand for shark products, coupled with our findings, suggest that global protective measures, such as the CITES Appendix II listing, were needed to ensure the effectiveness of local protective legislation and management regulations currently in place in a handful of countries. Furthermore, the possible genetic flow between distant white shark subpopulations likely plays a pivotal role in the maintenance of their genetic variability. Its disruption via the extirpation of one of these subpopulations, or from the killing of the migrating sharks (especially pregnant females), could have disproportionate negative consequences for biodiversity and conservation, and further highlights the need for more effective and broader management and conservation measures for marine apex-predators that include multinational and international waters. Pop up archival tags have been described in detail elsewhere. Briefly, these instruments record temperature, pressure (translated to depth) and light intensity every 15-120 sec for the period of deployment and automatically release themselves at a pre-programmed date. Once they float to the surface they transmit a summary of the recorded data to polar-orbiting satellites carrying the Argos System. PAT tags built by Wildlife Computers, Redmond, WA were attached by inserting a dart on the shark’s back just below the base of the first dorsal fin as the shark swam next to the vessel. PAT tags were programmed for deployment periods of between 9 and 53 weeks and data collection frequency was set to either every 30 or 60 sec depending on deployment period. Tags were programmed using temperature bins with upper limits at 0, 5, 7, 10, 12, 15, 17.5, 20, 22, 24, 27, and 30° C; depth bin upper limits were 0, 0.5, 5, 10, 20, 30, 50, 100, 200, 500, 750, and 900m. Sharks were attracted to our vessel by releasing a trail of fish oil, shark liver or other marine products, then lured into tagging position by pulling a rope with a large bait. 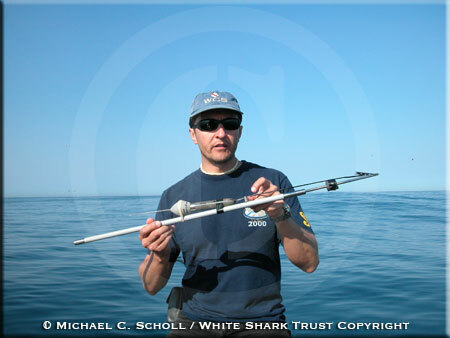 The size of PAT-tagged sharks was visually estimated by 3 qualified observers and an average or range was recorded. Two types of satellite tags built by Wildlife Computers were used. Smart Position and Temperature Transmitting (SPOT) tags measure ambient temperature from 2.2 to +50 °C, with a resolution of 0.2 °C. SPOT tags were deployed disabling the temperature recording program in order to maximize battery life. Satellite Depth Recording (SDR-T16) tags record and summarize data on dive depth and duration, and time spent at user-programmed depth ranges up to 1,000m. Summary data for the previous 24 hrs is sent with every transmission. SDR tags were programmed using depth ranges with upper limits of 0, 8, 12, 16, 20, 52, 100, 200, 500 and 760 m.
Both types of satellite tags transmit radio signals to the Argos System at 9 frequencies of 40-45 sec; a salt-water switch allows the instrument to send a transmission whenever it clears the ocean surface. Sharks were attracted to the surface as described above, where individuals were selected and caught on baited hooks and lifted out of the water using a purpose-built metallic cradle fixed to the side of a research vessel. Satellite tags were fixed to the first dorsal fin using nylon pins, brass washers and steel nuts. The choice of metals intends to ensure tag-shedding after approximately 9-12 months. Each shark was measured on a straight line to the nearest cm for fork and precaudal length. 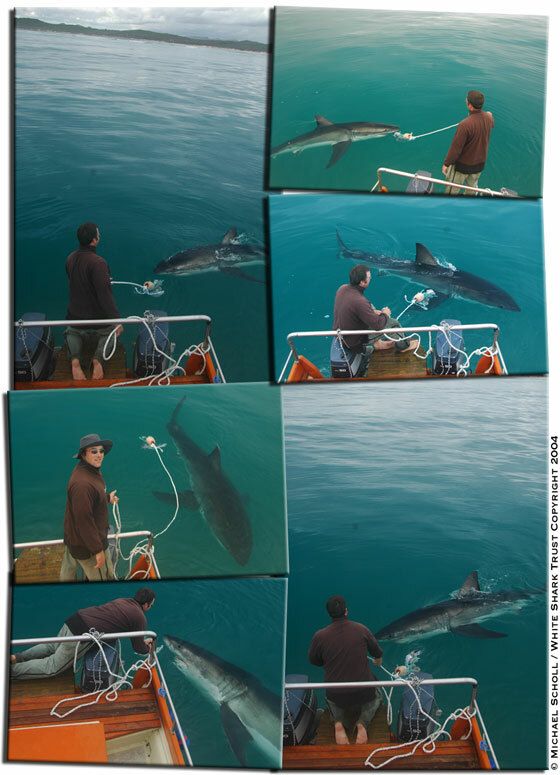 A continuing acoustic telemetry study has been conducted in Mossel Bay since June 200114. Six VR2 bottom-monitors (VEMCO, Shad Bay, Nova Scotia) were placed between 34° 07-15 S and 22°06-08 E and two others were added in June 2002. Acoustic transmitters (V16, RCODE 69 kHz, VEMCO) were similarly attached as for PAT tags. Acoustic pulse-rate was set at 40-70 seconds and battery life was estimated at 14 months. Bottom-monitors archived the presence of tagged white shark within a 400 m range (environmental conditions may result in a wide range of detection distance). A shark was considered present if a single detection at any bottom-monitor was archived on a given day. 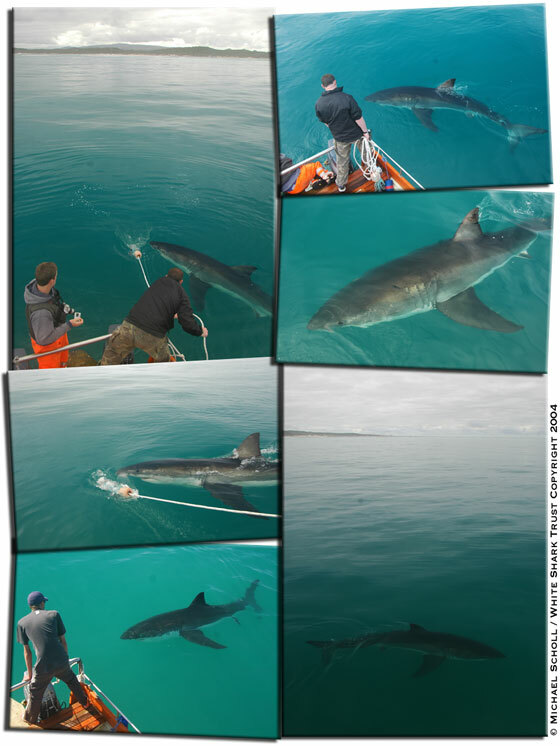 White sharks were identified off Gansbaai (Dyer Island and neighbouring areas) using a photographic fingerprinting methodology based mainly on features of the first dorsal fin’s posterior margin and other fin characteristics. Attraction was similar to that described above. Photographs recorded both sides of the first dorsal fin whenever possible using either a 35 mm camera and slide film, or a high-resolution digital camera. Body markings and sketches of any recognizable features completed the identification record. Data comprised 900 fieldwork days (average of 3.5 days/week) and 4,024 hours of observation in the field (average 4.5 hours/day) during the period 6/Oct/97-28/Feb/04. No fieldwork was conducted during the following 10 periods: January-July 1998, March 1999, mid May 2000-mid June 2000, 20 September 2000-6 October 2000, mid March 2001-early May 2001, November 2001, April 2002-mid May 2002, 14-31 December 2002, March 2003, second half of November 2003, and mid-January early February 2004. Financial support for the PAT and satellite-tag study was provided by the Roe Foundation, WCS, and the South African Government. A complete list of sponsors for the photographic-ID study is available here. 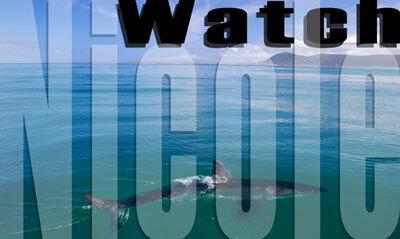 The acoustic-tag study was financed by the South African Government and contributions from IFAW, WWF, and PADI Aware. The authors’ appreciation goes to: the Natal Sharks Board and particularly Sheldon Dudley, Geremy Cliff, Kevin Cox and Wayne Harrison for valuable field-work assistance and helpful discussions in the satellite-tag study, and to Sheldon Dudley for assistance in the design and supervision of the acoustic-tag study; to Andre Boustany, Heidi Dewar, John Stevens, David Holts, Lee Hulbert, Rachel Graham and Michael Domeier for advice and help with tagging methodologies and equipment; to Barbara Mangold (formerly WCS), Chap Masterton, Sven Parsons, Pieter Koen, Dion Woodborne, and Pierre Fréon (MCM) for the monitoring and health maintenance of sharks during satellite-tagging; to Linda Staverees and Dandy Reynolds (MCM) and Michael Rutzen for support and assistance with satellite-tag field work; to Laurent Drapeau (MCM) for providing GIS shape files of Southern Africa; to Smit Marine for maintaining bottom-receivers, Marthan N. Bester (University of Pretoria) for supervision and Deon Sadie (formerly University of Stellenbosch) for conception of the acoustic tag-study; to Roy and Jackie Portway for assistance in program design and logistical support in acoustic study and field-assistance in satellite-tag study. Ramón Bonfil conceived, designed and led the PAT and satellite-tag study, data analysis and publication write-up. Michael Meyer assisted with design and co-led implementation of the PAT and satellite-tag study and assisted with the acoustic-tag study. Michael C. Scholl developed and implemented the photo-identification study and data analysis, and assisted with the PAT and satellite-tag field-work. Ryan Johnson co-designed and conducted the acoustic-tag study and data analysis, and assisted with design and implementation of satellite-tag study. Shannon O’Brien co-led the PAT and satellite-tag data analysis and preparation of figures for publication, and assisted in field work. Herman Oosthuizen co-led the PAT and satellite-tag study and assisted in field work, and designed and led the acoustic tag study. Stephan Swanson and Deon Kotze assisted with preparations and field work for the acoustic, and PAT and satellite-tag studies. Michael Paterson co-led equipment design and assisted with fieldwork for the satellite-tag study. SVZ online: Deutschland/Welt "Hai schwimmt Rekordtempo"
Rekord: Weißer Hai wurde über 20.000 km verfolgt auf nullzeit.at - Tauchen, Segeln und Surfen in Österreich und dem Rest der Welt - Wassersport total! "The Waterbury Connecticut Republican American Newspaper"